From her native Austria to the limelight of Hollywood, Hedy Lamarr was constantly bombarded with societal limitations and personal obstacles—including her own beauty. Only through courage, ambition, and intellect would she rise to become both a cultural icon and an unparalleled inventor whose creations would alter the course of history. Creators William Roy and Sylvain Dorange use the graphic novel medium to recount the biography of a genius inventor who happened to be “The Most Beautiful Woman in the World”. From a childhood filled with curiosity and ambition despite the stereotypes imposed on her, to an abusive marriage that she ingeniously escaped from, to finding her way to stardom in the City of Angels in the face of rampant sexism and harassment, Hedy Lamarr would not only become a glamorous star of the Golden Age of Hollywood, alongside icons like Judy Garland and Clark Gable, but also an unparalleled inventor. She would fashion designs to revolutionize the planes built by Howard Hughes, and come up with a secret communication system that helped the Allies against the Nazis, a technology that would become the blueprint for what we know today as "Wi-Fi." A visionary that never feared going after her goals and defied convention at every turn, Hedy Lamarr was a true woman of wonder. "...the gorgeous comic from Humanoids is a celebration of the life and work of Lamarr." "William Roy’s sophisticated, smartly-written graphic novel moves at a brisk, energetic pace. 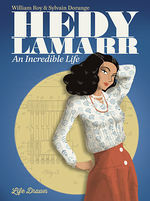 It not only chronicles Hedy’s independence, drive, creativity, and intelligence but also accentuates her many significant yet little-known achievements beyond tinseltown." "...tribute to her complicated life." "...a graphic novelization of her life from writer William Roy and artist Sylvain Dorange that you’ve gotta see." "...this graphic novel is wonderful. It’s a really accessible format that all ages can enjoy."